The 1st Marathon for the Development of Innovative Applications and Services for smart cities will be held in Cyprus. Cyta Smartcity Crowdhackathon will take place on 23, 24 and 25 February with the support of the Innovation and Idea Development Center of Cyta. Smartcity Open Day will take place on Wednesday 17.01.2018 from 10:00 to 15:00 at the central offices of Cyta. It will feature a discussion on Cyta Smartcity Crowdhackathon which will take place on February 23-25, the process that we will follow to explore issues and challenges, the issues that municipalities wish to address, good practices, and existing technology solutions will be presented as well. We invite representatives of Municipalities, companies and organizations that wish to actively participate in Cyta Smartcity Crowdhackathon as sponsors, supporters or participants to attend Smartcity Open Day and the discussion on smart cities. 11:00 - 11:30 George Karamanolis, CTO/CIO & Co-Founder Crowdpolicy, Presentation of the Cyta Smartcity Crowdhackathon process as well as main technological challenges. 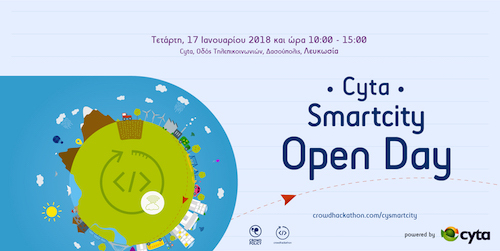 11:30 - 12:00 Ioannis Tsiamis, Chairman of the Committee for eGovernment of KEDE, Crowdhackathon City Challenge in Greece and the next steps of Smartcity Accelerator. Costas Pantziaros, Tasoula Kamenou, Use of Digital Technologies and Sustainable Economic Models. 13:00 - 14:00 Discussion on the Presentation of Good Practices by Municipalities as well as the problems and challenges of the Municipalities that will be incorporated into the marathon specifications, Presentation of the marathon challenges that will be incorporated into the specifications. Coordinated by George Karamanolis, CTO / CIO & Co-Founder Crowdpolicy. Demetris Papallis, Manager IT Governance @ Bank Of Cyprus, Creation of new services using the APIs of the Bank of Cyprus. Alexandros Tsatsiamis, General Manager, Christos Christou, Adviser on Urban Development, ΑΤManagement (www.atmanagement.gr),The financing tool of Integrated Spatial Investments for urban development and good implementation practices by Greece. Harris Goulios: Chief Commercial Operations Officer OTS (www.ots.gr), Good practices of smart cities. Panagiotis Pieri, Founder Risetech Media (www.risetechmedia.com), The use of chatbots to assist residents and visitors of Municipalities. Dr. Antonis Hadjiantonis, Senior Engineer, CyRIC Ltd (www.cyric.eu), ΙοΤ innovative solutions to the challenges Municipalities face funded by the EU and Cyprus. Συμμετοχή στο Open Day Registrations period has ended. Δημοσιογράφος Registrations period has ended.